When i saw this cake in masterchef,i so wanted to this.Once i had much milk left and i made rasgullas.Then the idea of making black forest rasgula cake struck me.That day was my sister's marriage anniversary so i got a occasion to celebrate her marriage anniversary with the cake baked by me. My brother-inlaw liked it a lot.But i was not able to take a proper picture of the cake.As there were quite a few people in their house at the time of cutting the cake and i was not able to take a proper picture of it. The taste was awesome and everyone liked it,in particular my b-law,he just loved it. The cake recipe was adopted from masterchef website here and rasgullas from my blog.The only change i did was i didn't use cream to cover the cake instead i made marzipan and used that to cover the cake.I added orange essence to the icing sugar and the taste was awesome. 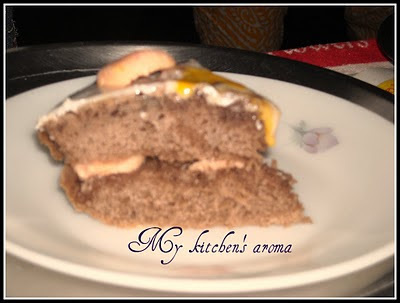 Rasgulla cake looks so mouthwatering and inviting.Love to try it out at my home. wow, I am such a big fan of it since I saw it in Master Chef too. Wow, you tried it too and nailed it. Amazing, I would love to try it some day. Cake with ragulla looks stunning and yummm! Me too had seen this on MC and was really fascinated by the combination! glad u made it for the special occassion! I'm a big fan since I saw him in a chef too. Wow, have you tried it also nailed it. Strangely enough, I would try it someday. 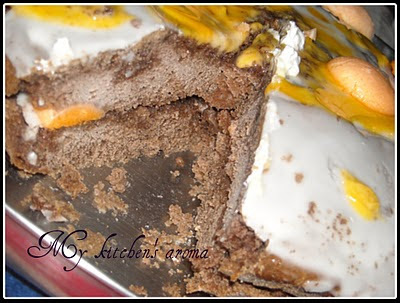 im now craving for this cake, really mouthwatering! !